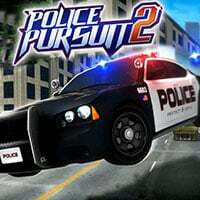 Police Pursuit 2 is an awesome open world game in which you become a police officer! It is your duty to try and bring law and order to the city and bring to justice the criminals living in the underworld. You can take a myriad of different missions such as car chases and thwarting robberies. The graphics are awesome and the city is waiting to be explored. Explore the big city of the bay area as a police officer completing your mission and duty. Look at your vehicles health and ensure it is repaired. So that you can reach the missions around the city. So can you show your skills as a police officer in Police Pursuit 2? Police Pursuit 2 Game is one of our Driving Games at Round Games. It also tagged as a car and 3D game. To play even more free games, view our most played and all games pages. If you want to play more games like Police Pursuit 2 Game: Then you can simply check out the games inside the game tags that are the most relevant to your interests or check the Action Games category or check the related games section at the end of the game page. Also make sure to check out Police Pursuit 3D Game, you may enjoy playing it. WASD or arrow keys to drive. Z or space bar to use nitro. X to drift. Tab to turn on/off the siren.